so here is a short list of the most Frequently Asked Questions. in having a lot of fun learning real sword techniques in a safe exciting way. How much does the Lightsaber Dueling Club classes cost? in advance. This works out to only $25 per month if you own your own saber and only $50 per month if you need to use one of our sabers. 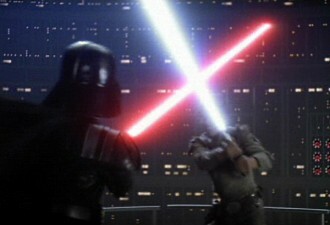 Do I need to own a Lightsaber to participate in the Lightsaber Dueling Club ? available for those that do not own their own to use during the class. Can I use a Lightsaber that I already own in this class ? custom made to withstand the extreme stresses of dueling. that you may own and discuss the possibility of using them in the class. Can I buy a combat Lightsaber from you to duel with? What will we be learning in the Lightsaber Dueling Club? In the beginning members of the Lightsaber Dueling Club will learn the basics of sword play and how they relate to this particular weapon. We will work on various sword skills including various blocks, strikes and footwork. As the students gain a little knowledge they will learn a special form and have the opportunity to engage in Safe, Fun duels with other members of the club. Can I take this class with my kids? Yes. We have three options available for members of the club. A kids only class, an adults only class, and a mixed class for families. 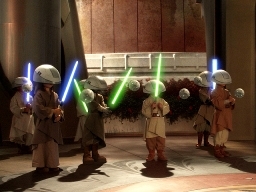 Will children be present at the Lightsaber Dueling Club? We have three options available for members of the club. A kids only class, an adults only class, and a mixed class for families. 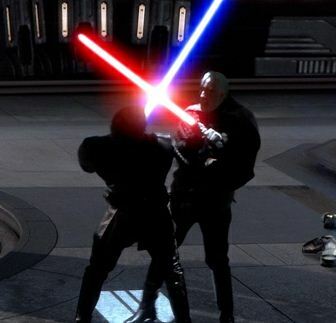 When are the classes for the Lightsaber Dueling Club? At this time, classes will either be every Tuesday or Thursday at 7PM depending on whether you are in the Adult only class or the Family class. There will also be a special Tournament day the last Saturday of each month where students of the Lightsaber Dueling Club can engage in Safe, Fun, Tournament style competition to further hone their skills. How often are the Lightsaber Dueling Club Classes? At this time, the classes will be once a week for each group, plus the Tournament day (the last Saturday of each month). Since this is a new class, as it develops further, if the demand is there additional class days will be offered and the schedule adjusted to accommodate our students as best we can. Be sure to check out our complete class schedule HERE. This class is specially designed to teach you real sword fighting skills, get you moving, and to give you a super fun activity that you can do alone, or share with friends and family ! And where else can you actually duel with Lightsabers ?! ?